Establishing crisp, clear column names is essential to keeping a large statistics project organized. At some point you will need to rename a column in r. Fortunately, there are multiple ways to get this done. You should consider clear column names as part of your official project documentation. I came to R from the Python language, which makes readability a key priority for developers. How often have you had to dust off your work six months later? Explain your ideas to a new hire? Debug the system at 3AM? Clean crisp code is your friend in these moments. The same goes for your data: you will likely want to rename columns in your data frame to make it easier to understand and maintain over time. 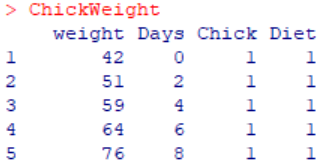 You can easily load the dataset into R by typing data(ChickWeight) into the R interpreter. The “Time” column name is vague – there are multiple units of time. Days, Weeks, Months. Who knows, we might even merge it with other data frame that also has a Time column. Then we would have a good start on a mess. So, we are going to change that column name to make it more explicit. We can start by changing it to “days”; if we were running a complicated experiment, additional description is good. We selected the “Time” field by name and successfully renamed it to “Days”. This value of this is that it simplifies things for future analysts and our collaborators. Data sets which explain themselves are a beautiful thing. Especially if you’re in charge of Data Quality Assurance. Rename columns to simple, natural terminology you can figure out several months later after you hand off your projects. Important: this technique assumes your data structure is effectively immutable. If you expect to make changes to the order of the columns or number of columns included in the future, we recommend the other approach. That being said… you do have the option of targeting the nth column for renaming. 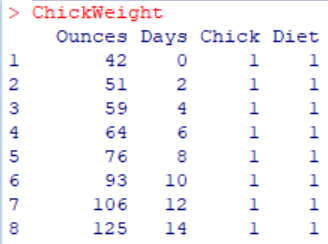 Example below, in this case flipping the Weight field to Ounces. Again, we need to stress the danger of using this approach if you expect to change your data frame design in the future. There is a substantial burden from using a brittle system like column position. That being said, this can be an excellent quick and dirty solution for throwaway data hygiene scripts if you’re in a hurry. Remapping fields based on name is a much safer way to proceed, of course, if you have time. There’s almost always more than one way to get things done in R.
You were previously able to directly use column index references in this package. with the more recent releases, you need to use a different approach to get the dplyr rename column by index function to work. We suggest turning the column names into a vector and using the index to select the right name from that vector. A good tip from traditional software development is that you easily spend as much time reading your code as writing it, particularly when you are working as part of a larger team. This is an especially important tip for folks transitioning from academia to industry. As you move from doing solo projects and projects with highly structured releases to supporting a business team, being able to pass projects to another analyst and quickly resume work from months or years ago is a crucial skill. Changing column names in your data frame so they are easy to understand can significantly simplify your life. And that concludes our summation of how to rename a column in R. By changing your column names into easily remembered references, you simplify future updates to your projects. And as we demonstrated, it isn’t hard to change column names in R. Just to be sure to think about the balance of speed vs. flexibility your want when you write your project code. This is part of our larger series about manipulating data in R. The topics most related to this one relate to cleaning up a data frame: how to remove a column in R and remove rows in R.
Or for the full index…. For more information about handy functions for cleaning up data, check out our functions reference.